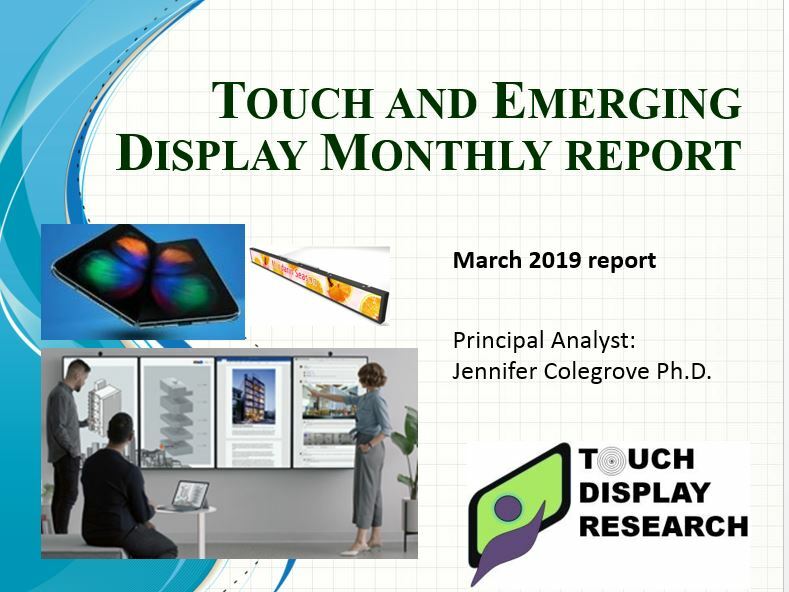 March Report: 6 Foldable Phones, Quantum Dot, Retail Touch Display Market - Touch Display Research, Inc.
Santa Clara, California, March 26, 2019— In the recently published “Touch and Emerging Display Monthly Report,” Touch Display Research Inc., a market research and consulting firm, analyzed the touch and emerging displays: 6 foldable phones, Quantum dot, flexible display, retail touch displays, touch screens and active pens. “I just returned from the 2019 Quantum Dot Forum hosted by Smithers, at the beautiful San Diego Marriott La Jolla, in California. It was my honor to meet you in person. In April 2019, I will fly to Long Beach, California to present the keynote address at the upcoming SVC (Society of Vacuum Coaters) TechCon 2019. It is the 62nd annual conference which will run from April 27 to May 2, 2019 at the Long Beach Convention center. In May, I’ll give a 90-minute seminar at SID DisplayWeek at the San Jose Convention Center. I hope to meet you face-to-face. Brief reviews will be contained in the monthly report,” said Dr. Jennifer Colegrove, CEO and Principal Analyst of Touch Display Research Inc., who has authored reports on the touch panel and emerging display industry for over ten years. The March 2019 report is available immediately. Touch Display Research, Inc. (https://TouchDisplayResearch.com) is a technology market research and consulting firm specializing in touch screen and emerging display technologies such as OLED displays, quantum dots, flexible displays, e-paper displays, ITO-replacement, Active pen, near-eye displays, smart windows, micro & mini LED, gesture controls, voice controls, and eye controls. Touch Display Research helps technology companies grow and connecting their technologies to the marketplace. We have been writing about OLED industry for over 10 years. We were the first company to publish Quantum Dot market reports. We were the first company to publish Active Pen market report, and ITO-replacement market report. We have always been there to analyze new and emerging technologies. Touch Display Research provides reports, consulting, and due diligence to touch suppliers, display manufacturers, semiconductor companies, consumer electronics ODMs/OEMs, material suppliers, investors and venture capitalists. For report and consulting, please visit our website: TouchDisplayResearch.com.